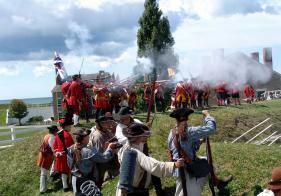 Oswego, NY - The annual encampment of the French and Indian War will take place at Fort Ontario State Historic Site, Oswego, NY, on Saturday August 29 from 10 AM to 4:30 PM, and Sunday August 30 from 10 AM to 3 PM. The sights, sounds, and smells of camp and garrison life will greet visitors as they visit camps of British, French and native American troops and warriors who fought each other on these ground in the 1750&apos;s. This year marks the 250th anniversary of both an important battle fought there in 1759 as well as the building of the second Fort Ontario. A special treat is in store for kids at the fort as Shari Crawford, early American activities specialist and teacher, will present her 18th Century Toys and Games program during public hours on Saturday and until 4 PM on Sunday. Some of the toys and games include stilts, trundling hoops, two-balls, bat & trap, shinny, marbles, cups and balls, skittles, and quoits. Crawford has conducted this and other programs for adults and children such as Open Fire Cooking, Clothing and Laundry, and English Country Dance at historic sites, schools, scout camps, and adult day camps around New York. A member of the Brigade of the American Revolution, Crawford has published articles on many aspects of 18th century life (www.18thcenturytoysandgames.com). There will also be historic seminars on important aspects of this savage war of conquest, sometimes called America&apos;s "first" world war. On Saturday at 11 AM, author and historian Alan Sterling will conduct a lecture "The French and Indian War in Central New York" which will be detailed account of the many forgotten battles, campaigns, the forts and huge invading armies and even navies that fought for control of this strategic area. Mr. Sterling will also be selling copies of his latest book, "French Raids on Burnetsfield: 1757 & 1758", as well as new prints by military artist Gary Zaboli of the action at Battle Island and the colonial attack on Fort Frontenac. On Sunday at 1 PM, Mr. Steve Perkins will give a talk and program on "Fort de Levis and the Fall of New France" which will recount the heroic defense of a small band of 350 French troops on a tiny island in the St. Lawrence River. Holding at bay the huge force of 12000 British, colonial and Native American troops for five days, and this forgotten but epic battle was the last hope for Canada before Montreal fell in 1760. A special guest will be John Muller, historian and director of the Revolutionary War period Fort Lee State Historic Site in Fort Lee, NJ. Muller will use the tools of an 18th century engineer to map out and interpret the actual locations of the field fortifications as they were in 1759. Mr. Muller&apos;s expertise in the field of engineering is unsurpassed. Another surprise will be clothing historian Missy Clark who will interpret a colonial milliners shop in one of the buildings at Fort Ontario. Clark has performed first person programming at many historic sites around the northeast, including Fort Ticonderoga, and has contributed articles on 18th century life to living history publications. Among the period vendors will be "Smoke and Fire", sutlers from Waterville, Ohio, who are purveyors of fine clothing, equipment, books and other items dealing with the colonial era. On both days their shop, under a huge tent, will be open to both participants and the public. Oswego was once the scene of international rivalry between the French and British, and the location of one of the most important trading posts in North America. Sometimes up to 300 traders operated out of Oswego with their own semi-permanent village of 70 log huts, situated in the vicinity of what is now Water Street. The first Fort Ontario was built in 1755 and was a simple eight-pointed wooden stockade. Along with Fort Oswego (built 1727) and Fort George (built 1755), these lonely outposts of the British lost about 400 men or half of their garrisons to disease, starvation and exposure during the terrible winter of 1755-56. Reinforced in the spring, the British and colonial troops were constantly harassed by scalping parties of Canadians and Indians. Most of these attacks originated from a secret advance French base established at "Cabin Cove", today&apos;s Sunset Bay. 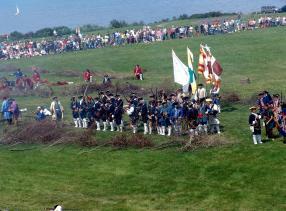 Fort Ontario was attacked by the French and Indians in May and June but held out. In a massive attack in August, 1756, the French commander-in-chief, the Marquis de Montcalm led 4000 troops and Indians and along with more than 25 pieces of heavy artillery, managed to get ashore at Baldwin&apos;s Bay without detection. Quickly siege operations began against Fort Ontario which fell on Friday the13th. After British commander Colonel James Mercer was cut in two by a cannonball, the other two forts quickly surrendered. All three forts were destroyed, the trader&apos;s village leveled, and a new British fleet taken. Of the 1700 prisoners 100 to 150 were massacred and scalped by the natives and Canadian militia who had broken into the rum supply. In 1758, Colonel John Bradstreet returned with 2000 colonial troops and used Oswego as his launching point in his successful campaign to take Fort Frontenac (Kingston, Ontario). A large victory cross erected by Montcalm&apos;s troops two years earlier was chopped down by Iroquois warriors. A replica of that cross may be seen today overlooking the lake near the parking area. This highly important campaign was a decisive blow to the French who found their supply lines cut off to the western posts, and helped to turn the war in favor of the British. The second Fort Ontario was built in 1759 by General Thomas Gage, the earthworks of which still exist today. 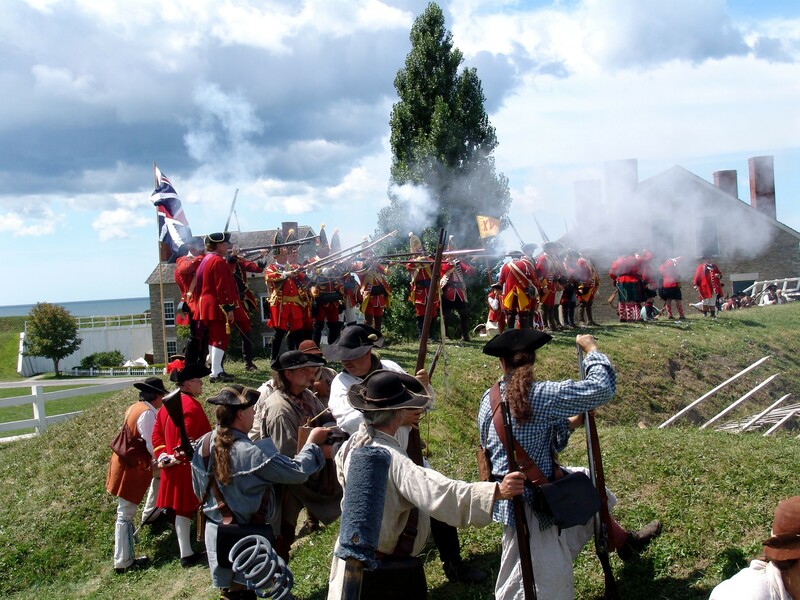 This year&apos;s 250th event will center on the campaign of 1759 when the British, under Sir William Johnson and Brigadier General John Prideaux were besieging Fort Niagara. Left behind at Oswego to guard communications and begin construction of the second Fort Ontario was Lt. Col. Frederick Haldimand and about 1300 men of the Royal Americans and New York Provincials. A French and Indian attacking force of 1200 under the famous Sulpician missionary Abbe Piquet and Duc de La Corne had left Fort La Presentation, on the St. Lawrence River, and secretly got their troops ashore east of Oswego where they quickly wiped out a party of wood cutters. When approaching a temporary field fortification that Haldimand had recently erected, Piquet halted his force to exhort them to victory and say a prayer, while urging his men to give no quarter to the English. This ruined any chance of surprise and gave the defenders a chance to prepare for attack. Several determined assaults were made by the French and Indians in the two day battle. The British were too strong to dislodge, and the French, believing they were in danger of being cut off from their bateaux, panicked, and made a frantic rush to regain their boats, even knocking down Piquet when he tried to stop them. Narrowly escaping death in this action was Captain Herkimer, either Nicholas of later Revolutionary War fame or his father, who, when out in his bateau was fired upon more than 150 times by the enemy. Captain Thomas Sowers, an important British engineer, was wounded. He later drew a plan of the new fort and the field defenses he had helped defend. British losses were at least 21 killed and wounded while French lost about 30 killed and many more wounded. Even the French believed that had the attack continued without Piquet&apos;s stopping them, that the British and provincials would have been quickly overrun. This year Fort Ontario hopes to expand on the outer earthworks we constructed two years ago, and duplicate the 1759 field fortifications close to their original locations. Barrels of food supplies that were intended for the British troops at Niagara and were used as temporary field defenses will be included in the defensive line. As in past years, a broken battlefield of logs, stumps, brush and debris will be recreated. 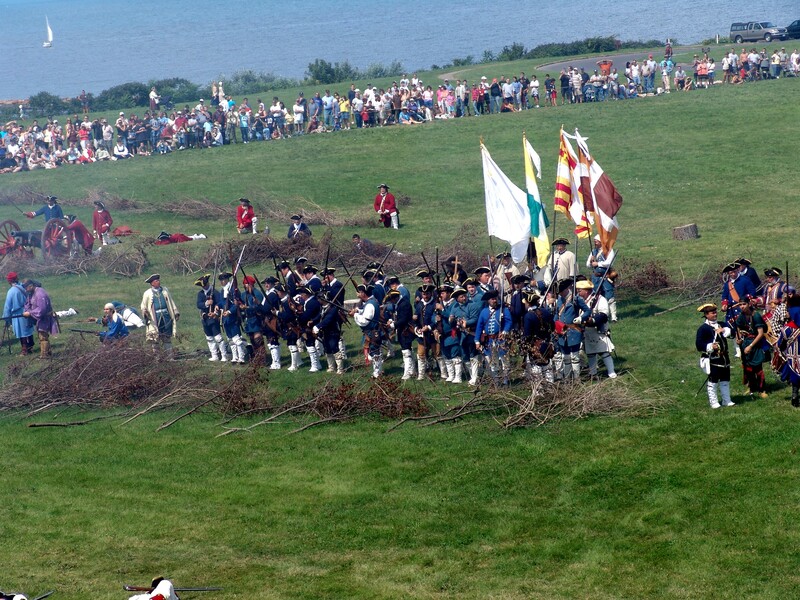 This British victory secured Johnson&apos;s rear guard and supplies and prevented the lifting of the siege of Fort Niagara. But conditions at this remote, frontier outpost remained wretched at best and winter proved a more formidable enemy than the French - 135 men died of scurvy out of a garrison of 613. In 1760 General Jeffery Amherst and over 12000 troops encamped here, and prepared for the final offensive against Canada resulting in the capture of Montreal. Oswego was also the setting for much of James Fenimore Cooper&apos;s classic novel "The Pathfinder". On both days military drills, ceremonies, cooking, sewing and other living history demonstrations will be held at the old fort. Regular admission prices will be charged, children 12 years of age and current members of the Friends of Fort Ontario will be admitted free. Fort Ontario State Historic Site is one of six historic sites and eighteen parks in the Central Region administered by the New York State Office of Parks, Recreation and Historic Preservation, Carol Ash - Commissioner. For more information on NYS Parks visit the agency website at www.nysparks.com or www.fortontario.com and for additional information on the event call Richard LaCrosse at (315) 343-4711.